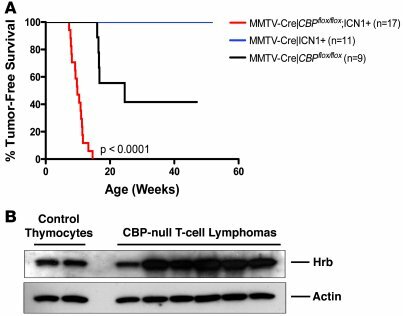 Notch activation cooperates with CBP loss to accelerate lymphomagenesis. (A) Kaplan-Meier survival curve of mice with either (a) conditional deletion of CBPflox/flox via an MMTV-Cre mediated excision (n = 9), (b) transgenic expression of ICN1 via MMTV-Cre mediated excision of a floxed STOP sequence sandwiched between the chicken β-actin promoter and ICN1 coding sequence (n = 11), or (c) transgenic for ICN1 expression and CBP-null (n = 17). P < 0.0001 using log-rank (Mantel-Cox) test. ICN1 transgenic mice developed T cell lymphomas around 98 weeks. (B) Western blot of lysates prepared from control thymocytes and 6 CBP-null T cell lymphomas, blotting for Hrb (clone 386–562) and actin (loading control).